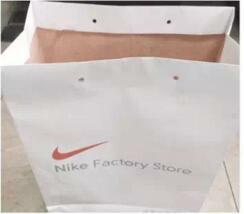 Paper Bags and Plastic Bags. WFD350-1/450-1 paper bag machine is with impressive quality and performance to meet different requirements. It adopts auto paper feeding system to keep sheet paper feeding continuously. It uses printed sheet paper as raw materials and makes the paper bag with top cardboard pasting, bag top folding as well as the double holes punching at one time so as to save labor cost to achieve higher working efficiency. This machine adopts touch screen and PLC control system with higher precision and speed. It is the best production line for making shopping bags, gift bags, super market bags, food bags, etc. It is with creasing function and adopts hotmelt glue system and can make many sizes of paper bags. Suitable paper: kraft paper, white cardboard, art paper, laminated paper. WFD350-1/450-1 single sheet type folds the bag mouth perforation portable paper bag computer is take the single sheet paper, a reel type card and the paper cord as a raw material, disposable completes the book plate card, folds the upper opening, becomes the tube, becomes the organ, the back cover, the compaction formation perfect craft, is suitable specially for the clothing, the footwear, the movement brand or the luxurious brand outsourcing handbag production. Has implemented the entire automated production truly, is direct the bag pack to give the client. Sheet fed Series Paper Carry Bag with handle machine is fully automatic machine for the production of paper bags with paper twisted rope handle. The material could be Sheet paper or printed sheet paper. Whole machine is controlled by computer central control system with touch screen. It can produce variable sizes paper bag and paste paper handle inline for completely paper bags without any manual process. The machine automatic paper fed from sheet, handle pasting line,top of bag folding, tube forming, bottom forming, bottom glue, bag forming and final bag output,or fold the top and punching holes without handle unit. All steps are completed in-line; this machine is an idea equipment for Twist handle paper carry bags and realize a fully automated line for garment, shoes or all luxury brands packing bag production line which could be directly deliver to customer bags. Having absorbed the new technology of domestic and abroad, we successfully developed a new kind of paper bag making machine. The materials should be printed sheet paper or non printed sheet paper as per end-user's preference. This machine features a continuous function of automatic paper feeding, gluing, creasing, bottom pasting and bag formation at a stroke. It is an ideal equipment for square bottom paper bags packing food grocery, Gift,etc without any manual process. This machine is built to make paper rolls or printed-paper rolls into bags for packing fast food like bread, loaf, KFC. Paper Baguette bags. 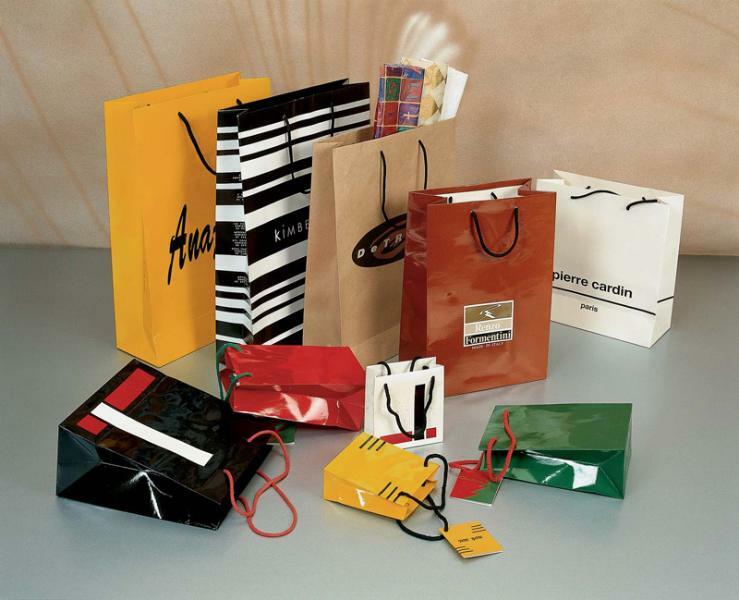 It is equipped with HMI for easy operation; with photocell for make the same printed paper bags. The bags can be many different dimensions. This machine is built to make shopping bags or food bags with paper rolls, paper can be pre-printed. Machine is equipped with a photocell device. This machine features a continuous function of automatic paper feeding, gluing, creasing, bottom-sticking and bag forming at a stroke. This is ideal equipment for making paper bag for shopping, loading foods, sugar, flour and so on. 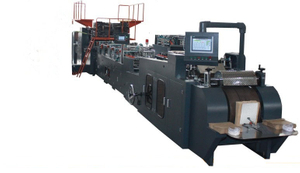 WFD350-1/450-1 paper bag machine is with impressive quality and performance to meet different requirements. It adopts auto paper feeding system to keep sheet paper feeding continuously. It uses printed sheet paper as raw materials and makes the paper bag with top cardboard pasting, bag top folding as well as the double holes punching at one time so as to save labor cost to achieve higher working efficiency. This machine adopts touch screen and PLC control system with higher precision and speed. It is the best production line for making shopping bags, gift bags, super market bags, food bags, etc. It is with creasing function and adopts hotmelt glue system and can make many sizes of paper bags. Suitable paper: kraft paper, white cardboard, art paper, laminated paper.